October 19th-30th Legends of Horror @ Casa Loma, 1 Austin Terrace. Experience an immersive theatrical interpretation of all of the classic horror figures as you go take part in a one hour, 1.5 km self-guided walk through the bowels of the historic castle. $40 in advance, $45 at the door. 5 pm Vintage Crawl Toronto @ various locations. Shop vintage from Kensington Market to Parkdale, and Gerrard East to Little Italy! With vintage stores specializing in housewares, menswear, womenswear, and more – there’s something for every vintage shopper. Full list of participating stores here. Until 10 pm. 7 pm #FNLROM: Fashion Night @ Royal Ontario Museum, 100 Queen’s Park. Celebrate the fabulous world of fashion! Immerse yourself in the ROM’s collections, and meet local designers at #FNLROM. 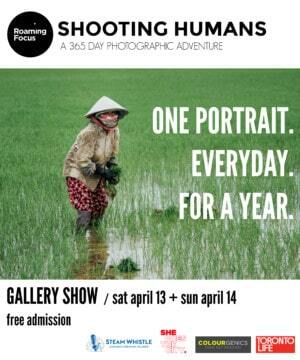 $15 tickets available online and at the door. 8 pm Pancakes & Booze Art Show @ The Opera House, 737 Queen St. E. Toronto’s largest underground art show, featuring 100+ artists, FREE pancake bar, live audio and visual performances, body painting, art battles, and more! $13 VIP skip-the-line passes available online, $10 at the door. 10 pm Rebel Hop @ The Piston, 937 Bloor St. W. Rebel Hop is back for yet another hot night of funk, soul, reggae, dancehall, hip-hop, and Motown – music guaranteed to make you sweat. DJs Gramera and Linx on the decks. 10 pm Bare @ The Shop under Parts & Labour, 1566 Queen St. W. Lose your inhibitions and take a walk on the wild side. DJs HRLD, Sada, and Sayyzon play rap, hip-hop, future sounds, RnB, house, and reggae. $5. 10 pm Renaissance: All ’90s @ DW Alexander, 19 Church St. ALL nineties. ALL Night. Featuring Renaissance resident Mista Jiggz playing a mix of RnB, hip-hop, reggae, house, pop, rock, and more. No cover, but guestlist is recommended (email info@dwalexander.com). 10 pm Yes Yes Y’all @ Nest, 423 College St. The hottest, sweatiest, busiest queer hip-hop/dancehall/RnB jam around! Vybz meets A$AP meets Kendrick meets Cham meets Foxy meets Ciara. New Jersey’s MikeQ joins the YYY Crew this month. $10. 10 pm Lab.our presents Thomas Cox @ Bambi’s, 1265 Dundas St. W. Pittsburgh’s Thomas Cox has been crafting dancefloor gems since 2011, and releasing choice artists as head of Love What You Feel records. Basic Soul Unit and J-UL will warm things up right. $5. 10:30 am “Mystical Landscapes: Masterpieces by Monet, van Gogh and more” Opening @ Art Gallery of Ontario, 317 Dundas St. W. The world debut of “Mystical Landscapes: Masterpieces from Monet, van Gogh and more,” the first exhibition of its kind to consider the intersection of art, nature and mysticism that lies behind some of the most beloved works of Western art. Accompany 36 artists from 15 countries – including Claude Monet, Vincent van Gogh, Paul Gauguin, Edvard Munch, James McNeill Whistler and Georgia O’Keeffe – on their spiritual journeys through nature. Until January 29th. Tickets available online. 11 am Fall Uber-SWAP @ Eastminster United Church, 310 Danforth Ave. Edit your closets and trade your best fall appropriate cast-offs with other stylish scavengers at the 20th Uber-SWAP event! Here’s how it works: bring your stash of in-season clothing and accessories (sweaters, dresses, jackets, skirts, pants, etc.) to the advance drop-off (October 19th from 5-7 pm in the basement of Eastminster United) or at 10 am the day of, and get ready to swap. Minimum of 12 approved items per person to participate (aim to bring 15+ items, as not everything is accepted). More details here. Until 2 pm. $10. 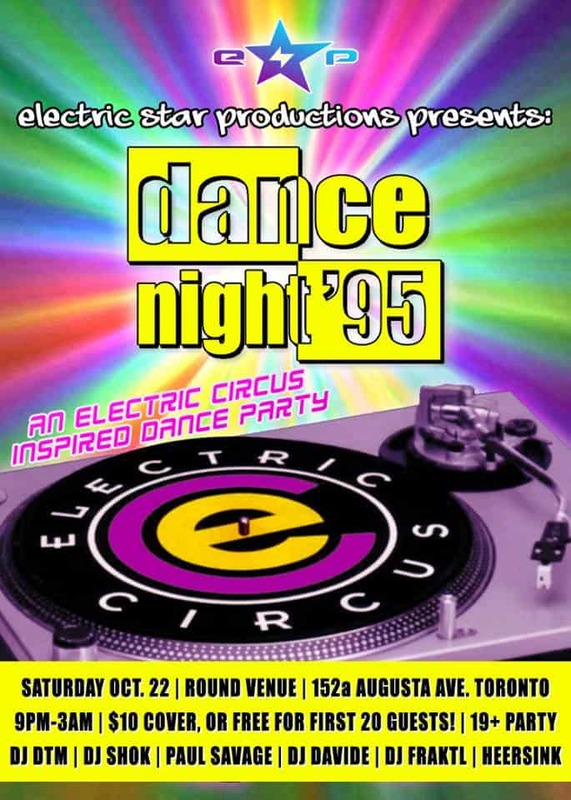 10 pm Dance Night ’95: An Electric Circus Experience @ ROUND Venue, 152-A Augusta Ave. Dance Night ’95 takes you back to the decade of dance in the city of love – back to the age of Electric Circus, Much Dance compilations, Pirate Radio, RPM at the foot of Jarvis, Energy 108, raves, dancing, and energy. DJs Shok, Paul Savage, Davide Ferrara, Fraktl, DTM, and Heersink playing the best in eurodance, trance, electronica, house, techno, and everything in between. 10 pm Saddle Up @ Owl’s Club, 847 Dovercourt Rd. Come to the Owl’s Club, a real legion in the heart of Toronto, and scuff up the floor to the sounds of Dolly, Willie, Loretta, and the rest of your honky-tonk favourites. You don’t need to know any two-step moves – they play all the good tunes, and only the best of the bad ones. No bro country! $5 (bar is cash only). 10 pm 69 Side of Love @ Lucky Shrike, 850 Dundas St. W. Dark Trip Dave Spinning non-stop soul, funk, dance, and disco on vinyl. Come get freaky! 10 pm Cold Shoulder @ The Shop under Parts & Labour, 1566 Queen St. W. Famous Players and Patrick McGuire playing rap music from 1992 to 2017. $5. 10 pm Hey Girl Hey @ The Steady, 1051 Bloor St. W. Do Saturday night right with a hip-hop and R&B dance party for queers! DJ Orange Pekoe playing your fav all-female jams + Drag-Queen-in-Residence Beardoncé keeping it CrazySexyCool. Free before 11 pm, $5 after. 10 pm Beam Me Up: Édition Spéciale @ The Piston, 937 Bloor St. W. Let the Beam Me Up residents A Digital Needle and Cyclist take you for a ride with Édition Spéciale, a trip around the world of disco! Dive into disco from Suriname, Brazil, Turkey, Côte d’Ivoire, Nigeria, the UK, Jamaica, Cameroon, Mexico, Cuba, and beyond. 10 pm Supernatural: 2000s Halloween Dance Party @ Sneaky Dee’s, 431 College St. For one night only, Sneaky Dee’s becomes the Roadhouse. Join the hunt and choose your side for a night of 2000s hits and classic supernatural favourites. $5 advance tickets available online (includes line bypass). 10 pm Willie Burns @ Bambi’s, 1265 Dundas St. W. Willie Burns has been around for years, deejaying as Speculator and producing as Grackle, Black Deer and many other aliases; hosting a weekly radio show (WTBS); managing the infamous record digging spot known as The Thing in Brooklyn; and running W.T. Records. $10 before midnight, $15 after. 1 pm Dogtoberfest @ Henderson Brewing Co., 128-A Sterling Rd. Grab your hund and lederhosen and come celebrate! Join Get Leashed & Company and Henderson Brewing Co. for an afternoon of craft beer, live entertainment, special surprises, and festive food truck fare. Friendly, leashed dogs welcome. Dog park etiquette applies. Petless humans welcome, too! Until 4 pm.